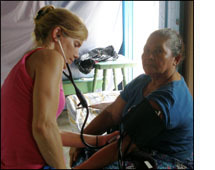 I went on a medical mission with the HOMBRE brigade affiliated with the Virginia Commonwealth University College of Medicine. This is part of an ongoing venture where physicians and medical students spend 1 - 2 weeks providing primary and acute care in remote villages in Honduras. Our team works with the NPH orphanage, a unique orphanage housing over 600 children as well as orphaned adults and adults afflicted with AIDS. NPH serves as a base where we organize supplies and medicines (over 1000 different medicines were donated) to take to villages during the brigade. NPH supplies a school bus and driver along with some if its own nurses, pharmacists and doctors as part of their own contribution to surrounding communities. We took an 8 hour trip to Carbajelas, a village in northern Honduras and set up a make-shift medical clinic in the local church, managing to piece together 6 exam rooms, a pharmacy and a dentist "office". The Padre spread word that we were coming and by 6:00 am each day patients would be lined up ready to be seen. Many came from the immediate villages, some managed to take a bus into town, while others walked through the hills and portaged across a rover to reach the clinic. We saw approximately 250 patients per day ranging from mothers and children, farm workers and adults, or pregnant women for prenatal visits. Although the immediate goal of the trip is to provide acute care to areas in great need, it is clear that sustainable, affordable, and accessible health care and education is necessary to affect the health and spirit of the communities on a long term basis. By returning annually we are attempting to continue relationships with the church and community whereby we can establish trust and eventually a program of continuity of care. Long term goals include determining the primary needs of the community and empower health from within. This year a much-needed dentist came on the trip and in addition to treating over 500 patients, she was able to use hundreds of toothbrushes and toothpaste we brought to spend an afternoon teaching proper oral hygiene to the children at the local school. This single preventative education measure is one that will have sustainable on-going benefits long after the brigade has left. It is this area of education and prevention that I am most interested in and using trips such as this to continue to find ways to help teach and empower the people within the village is one of the most satisfying parts of the medical missions. Thanks to the help from organizations such as yours I was able to return for a second time and look forward to continuing the yearly missions and thereby building long term relationships with the communities in order to reach these goals. A second goal for the physicians on the mission is to provide medical students with an incredible opportunity for hands-on training early in their medical career. We had eight first year students who assessed patients, translated the history for us and fully participated in evaluation, diagnosis, and treatment. Working in this immersion setting with conditions rarely encountered in US medical clinics brought out the best in these young physicians and I believe they taught us as much as we taught them. They brought with them bright-eyed enthusiasm for practicing medicine and continual learning along with the positive belief that we can truly make a difference through medicine. And, as always, I found it was the patients them selves, the communities we served, with the vast economical and cultural differences between us that taught me the most. Gratitude for where we live, the health we have, and the opportunity to share that with someone else is the best medicine we can offer. Thank you again for your support.